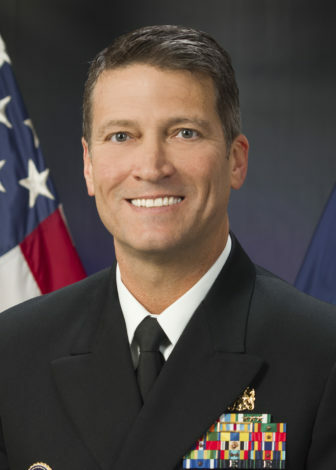 Washington – Embattled Rear Adm. Ronny Jackson, White House physician and a graduate of the Navy’s Underseas Medical Officer Program in Groton, on Thursday withdrew as President Donald Trump’s nominee to lead the Department of Veterans Affairs. His nomination was hampered by a number of allegations about Jackson’s professional conduct, including allegations he was “abusive” to his colleagues, loosely handled prescription pain medications and was periodically intoxicated on the job. Sen. Richard Blumenthal, D-Conn., a member of the Senate Veterans’ Affairs Committee, which is tasked to vet the nomination, blamed Trump for the implosion of the nomination. “In the meantime, this deeply flawed process should end the administration’s repeated failures in screening and scrutinizing top-level nominees,” Blumenthal said. Trump’s cabinet has had a high rate of turnover and a number of cabinet official have faced scrutiny over their spending habits and other actions, including Environmental Protection Agency Administrator Scott Pruitt and Housing and Urban Development Secretary Ben Carson. Not only was he an honor graduate at the Navy’s Undersea Medical Officer Program in Groton, but his bio says Jackson was “uniquely qualified in submarine and hyperbaric medicine.” Jackson also was an instructor at the Naval Diving and Salvage Training Center in Panama City, Florida, and a diving safety officer at the Naval Safety Center in Norfolk, Va.
Jackson began his residency in emergency medicine in 2001 at Portsmouth Naval Medical Center, finishing at the top of his class and receiving the honor graduate designation, his official biography says. But even Trump acknowledged Jackson lacked a background in running a large government agency, something that concerned both Democratic and Republican lawmakers. “There’s a lack of experience,” Trump said. A confirmation hearing for Jackson in the Senate Veterans’ Affairs Committee had been scheduled for Wednesday, but was postponed indefinitely to give panel members time to assess allegations about the candidate’s behavior. On Tuesday Trump called Jackson “one of the finest people I have ever met,” and said it was up to the candidate to decide whether to continue with the arduous nomination process.